New style....this is our version of Claudia's gown from Interview with the Vampire. This can be made in any color...fabric is Taffeta. Ruffle bottom front, ruffle bottom apron, both are trimmed in photo with beaded trim. We can also use venise lace instead. Back up gown is pulled up into ruches/draping. Victorian bodice has small pouf sleeves, laces in back, and has appliques and trim on arms. This can be made in your size, we will get your measurement info at the time of your order...as well as go over colors, pretty much any color is available. Would look beautiful in other colors as well! Would make a great gothic or victorian wedding gown, we can do all white or ivory too. Here is our new style, based off the Claudia gown from the movie Interview with the Vampire. 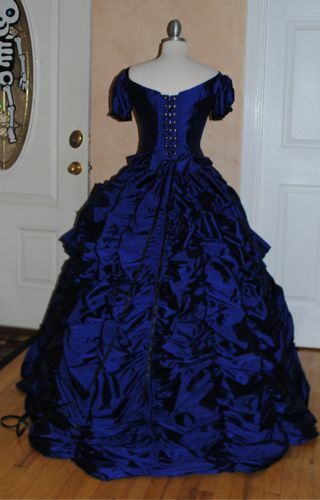 (we have Madeline also) This is a gorgeous royal blue faux silk gown, with all black sparkle/beaded laces and trims. Bodice is victorian style, slightly off shoulder with small pouf sleeves, black appliqués at neckline, and small trim on sleeve. Skirt is nice and full, has front apron and ruffle at bottom with beaded sparkle trims. Back of gown has dramatic ruches. Bodice is lined and has boning, laces up in back so it is adjustable. 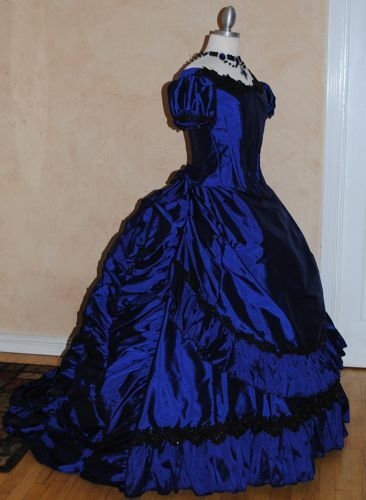 We will include a hoop crinoline slip, or a black hoop slip your choice. Pick the size closest to you, and we will get your measurements and hold one in your size. You can custom order this in other sizes/colors in the Movie Gown category…this listing is for pre-ordering a halloween gown/costume. Samples from photoshoots are in available in the In-Stock category. Beautiful new images by Jen Garcia of LeMewPhoto.com, model is Bryona Ashly. We have the Ringlet wigs available in blonde (shown) and silver.